2019 marks the fifth year since Irish Water was created and in this time the new national utility has strived to meet stringent water and environmental quality regulations, and attain essential EU standards. However, in order to reach these the sector must develop and deploy new technologies and innovative ways of working. The eighth annual ‘Ireland Water’ conference held last week in Ashbourne, near Dublin sought to address these critical questions and after a highly successful presence at the recent ‘Water Northern Ireland’ event, Jacopa’s Managing Director, Alex Lloyd and Contracts Manager, Peter Murnin were there to present the Company’s innovative and sustainable technologies to tackle current and future wastewater treatment challenges. 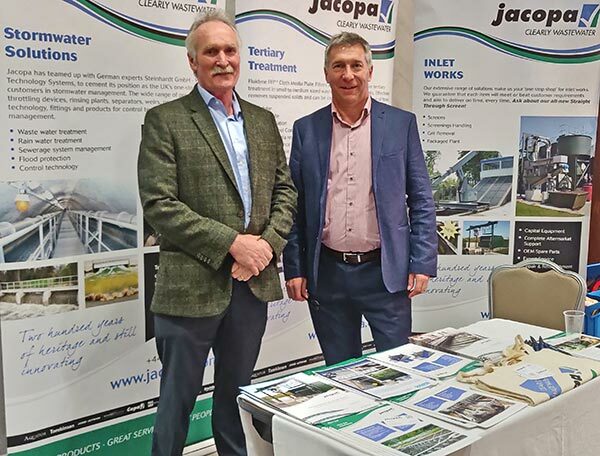 Jacopa Contracts Manager, Peter Murnin (left) with Managing Director, Alex Lloyd.